The chefs, owners, and trends that are defining and driving Indian food in America—a romp of flavors, fusion, creativity, and entrepreneurship. Last summer I enjoyed a great culinary journey across India: I visited Anjappar, a noted ‘military hotel’ in Chennai, famous for its nonvegetarian Chettinad cooking. This was followed by the iconic Saravana Bhavan, beloved for its dosas, uttappams, and other vegetarian delights. I next ate my favorite street foods at Kailash Parbhat, my family’s favorite Sindhi eatery in the by-lanes of South Mumbai. Final stop was, of course, at my hometown Delhi’s classic Moti Mahal, bringing back childhood memories of my first taste of their divine Murg Makhani. Yet, you’ll be surprised to know that I visited all these treasure troves of regional cuisine without ever boarding a flight or stepping out of America! My New York City mass transit card frugally took me to all of these restaurants by subway. Yes, it’s true—Moti Mahal, Anjappar, Saravana Bhavan, and Kailash Parbhat, famous names in India, are all in Manhattan, New York now. Indeed, the No. 1 reason for growth of Indian food in America is the ever-burgeoning Indian population in the US. Indian food eateries seem to pop up wherever there are Indians—which is basically everywhere! Now Indian restaurants are all over the map of America; forget Red State and Blue State, you probably have Chicken Tikka Masala State everywhere! The story began many years ago. The first Indian restaurant to open in New York was Taj Mahal Hindu Restaurant in 1918, on 42nd Street, serving Persian and ‘Hindu’ food. Since then thousands of Indian restaurants have opened (and many have closed) in the US, with a mixed repertoire of food—good, bad, and indifferent. And only a rare few out of these thousands have been knockout establishments that have been celebrated as “destination” restaurants. 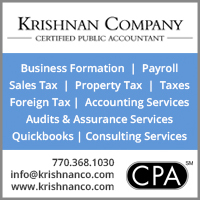 A recent study showed that there are 5,000 Indian restaurants in the US. Impressive, until you compare with Chinese restaurants–40,000 and counting! All the same, fans of Indian food are large in number, people who cannot live without their samosa fix and their dash of desi spices; that includes not only people from the Indian sub-continent but also people of other races, some of whom have traveled to India or experimented with Indian spices, even in their own cuisine. On a more positive note, the Indian restaurant scene is experiencing a sea change, from radically overhauled recipes to décor and ambience. Driving this trend are restaurateurs who have moved out of their Chicken Tikka–Saag Paneer comfort zone and strive to give diners a rich and authentic experience of India’s diverse cuisine. 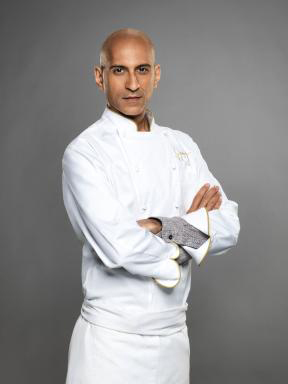 A host of celebrity chefs have helped turn the spotlight on Indian cuisine—well-known names include Hemant Mathur, Vikas Khanna, Maneet Chauhan, Suvir Saran, and Jehangir Mehta in New York who have reinterpreted Indian cuisine for American audiences. Besides these notables, there’s an enterprising cast of characters venturing into the food business from start-up dreamers to foodies going professional. A true global citizen, Cardoz has a foot in both continents, having just opened a cafe in Mumbai called Bombay Canteen which offers his own interpretation of dishes from his childhood such as Goan Pulled Pork Vindaloo, Chicken-Kokum Chilli Fry, and Brown Butter and Green Chili Dosa. He also has desserts which make you want to fly back to India to check them out—Gulab Nut (gulab jamun with pista cream) and Masala Chai Popsicles. Vikas Khanna (left), the heavyweight champ of celebrity Indian chefs, is the host of the wildly popular TV show MasterChef India, and the man behind Junoon, a destination Indian restaurant in New York City where Khanna is based. 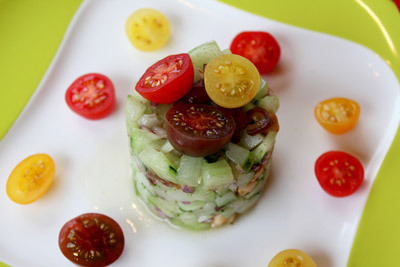 New York City is the American capital of desi food and several topnotch restaurants such as Tulsi, Junoon, Amma, Tamarind, Devi, and Benares are headed by high wattage chefs. 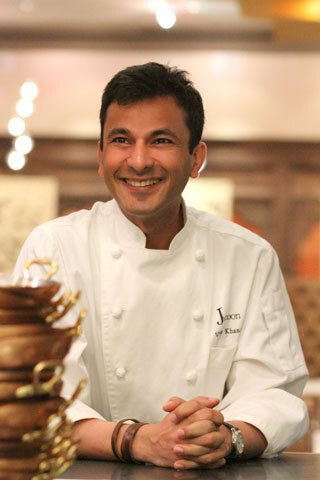 Vikas Khanna of the Michelin-starred Junoon shot up the culinary celebrity chart by hosting the popular TV Shows MasterChef India, MasterChef Junior and Coastal Curries. Rajesh Bhardwaj, the owner of Junoon, has global ambitions and has opened a second Junoon in Dubai in Sheikh Zayed Road’s Shangri-La Hotel. Hemant Mathur (left) worked with Suvir Saran, for Devi, the country’s first Michelin-starred Indian restaurant in 2007. 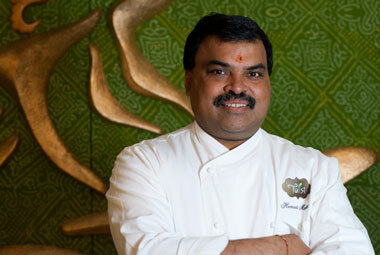 Now he heads another Michelin rated restaurant called Tulsi, along with a few other trend-setting restaurants. New York’s Indian food industry is in a state of constant churn thanks to the ambitions and creative endeavors of these famous chefs. Hemant Mathur, a noted tandoor master and thal chef, was first associated with Devi and then with Tulsi; now he manages all of six Indian restaurants in New York, each featuring a regional cuisine. 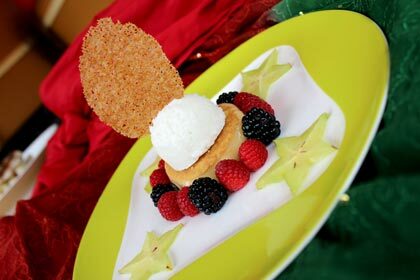 Besides overseeing the kitchens and menus, he is also tasked with creating signature dishes and specials inspired by each venue’s regional focus. During his early years in New York, he contributed to the success of some of the city’s top Indian restaurants, including Tamarind, Diwan, and Amma. Mathur has also taken the lead in nurturing regional cuisine in New York by opening Haldi, a new restaurant showcasing Bengali food. Awadh’s complex regional specialties such as Degchi Biryani (top) and Galouti Kababs (below). 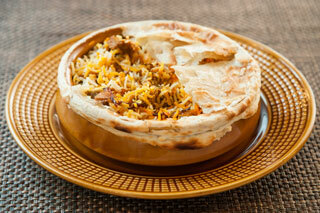 Moti Mahal, inspired by Old Delhi’s signature restaurant is now open for business on Manhattan’s Upper East Side. The restaurant is owned by Gaurav Anand, a young chef who has opened three restaurants with lightning speed—Bhatti Grill, Moti Mahal Delux, and now, Awadh, a bastion of Lucknowi cuisine. 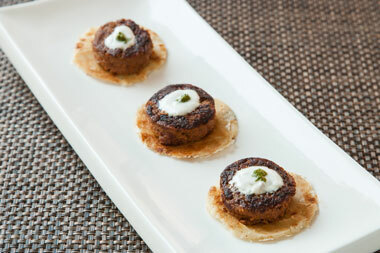 At Awadh, New Yorkers get a taste of complex regional specialties such as Galouti Kababs and Ulta Tawa Paratha. 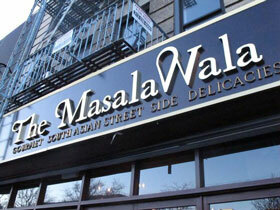 MasalaWala (below left): One of the new crop of small, affordable neighborhood eateries that offer high quality cuisine without breaking the bank. Payal Saha (left) of the Kati Roll Company, one of the few successful small chains of restaurants that have locations in New York City and London, England. No topic on Indian culinary crusaders in America would be complete without mention of Payal Saha whose Kati Roll Company introduced these delicious, grab-and-go treats to the streets of New York. Kati Roll has grown to three branches in New York and one in London. Besides using traditional desi fillings, Saha has also introduced organic salads with three Indian-inspired dressings—mint yogurt, lime cilantro, and cumin mustard. 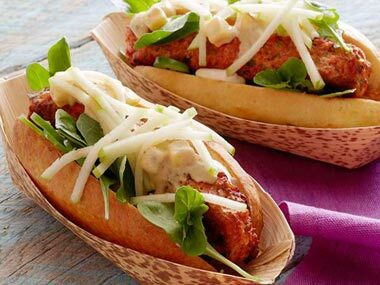 Catering to the health-conscious segment of the market, these fillings are also served on a whole wheat roll. 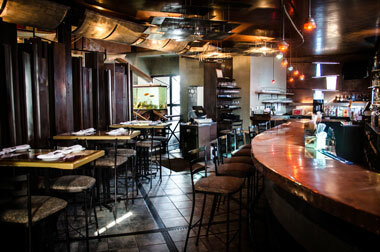 The interior of one of the trendsetting Thali restaurants and some of its many creative dishes. It’s too early to say whether this is a trend but Indian restaurants now seem to be springing up in states that don’t necessarily have large Indian- American populations. 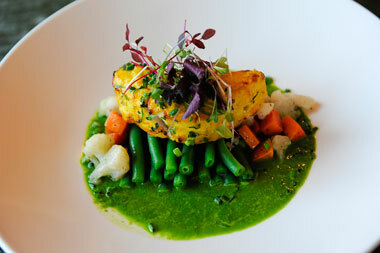 Prasad Chirnomula is the chef behind four Thali restaurants in New Haven, Connecticut and also a Mexican restaurant, Oaxaca Kitchen. The Thali restaurants feature cuisines from all over India with dishes such as Konkan Crab from Kerala and Rajasthani kababs and Lal Maas from the North. Chirnomula is also introducing Hyderabadi cuisine with specialties like Degchi Biryani, Dum Ka Murgh and Mirchi Ka Salan. Thali Two which is a contemporary eatery on the Yale campus is totally vegetarian with focus on South Indian tiffins and snacks like dosas, idli, and vadas as well as chole bhature, poori bhaji and pav bhaji. Ivy Leaguers are enthusiastic in their approval! Indian chefs, it would seem, are also gaining prominence in mainstream media. 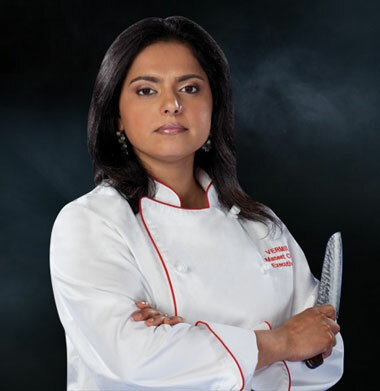 New York chef Maneet Chauhan is a judge on Food Network’s Emmy Award-nominated show Chopped. 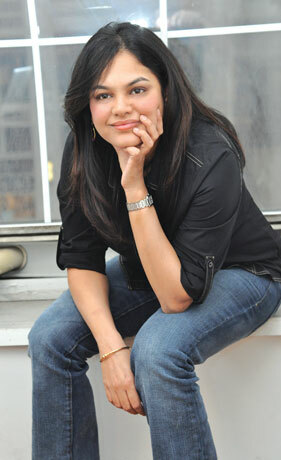 In fact, she’s the only Indian woman chef to ever compete on Iron Chef and Next Iron Chef. From heading Vermilion in Chicago and New York, Chauhan decided to go independent, opening Chauhan Ale & Masala House in Nashville. Can bhangra and dhols be far behind in the capital of country music? As co-owner and Executive Chef, Chauhan has some interesting fusion food to offer—Malai Methi Salmon served with kalonji-sautéed collard greens, anyone? In her kitchen, the traditional American burger is anointed with mint and served with masala fries, an eclectic blend of tradition and modernity from this Punjabi American! With the vast array of multicultural flavorings vying for our attention on supermarket shelves, it’s not uncommon for consumers to add green chilli and a sprinkle of masala to their spaghetti or Thai spices to jazz up a plain old chicken dish. Savvy chefs have caught on to this trend. And so you have a restaurant like Rohini Dey’s Vermilion (Chicago, New York) that offers Indian cuisine with a Latino beat. The Drunken Munkey is a new restaurant in New York which specializes in Anglo-Indian food, with classics like Railway Chicken Curry and Anglo-Indian Beef Stew. The menu, designed by owner Arun Mirchandani is laced with Raj nostalgia and unexpected touches of whimsy. So you have a Chilli Cheese Omelette keeping company with his mother’s home recipes like Sindhi Fish Curry and Churchgate Pao Bhaji. It’s a nod to the bistros and supper clubs of ‘Old Bombay’ and certainly offers a different angle to Indian food than what is usually seen in the US. The fun element in Indian food is a new trend; typically a younger, bolder generation that’s high on experimentation and risk-taking is dabbling in these untested waters. 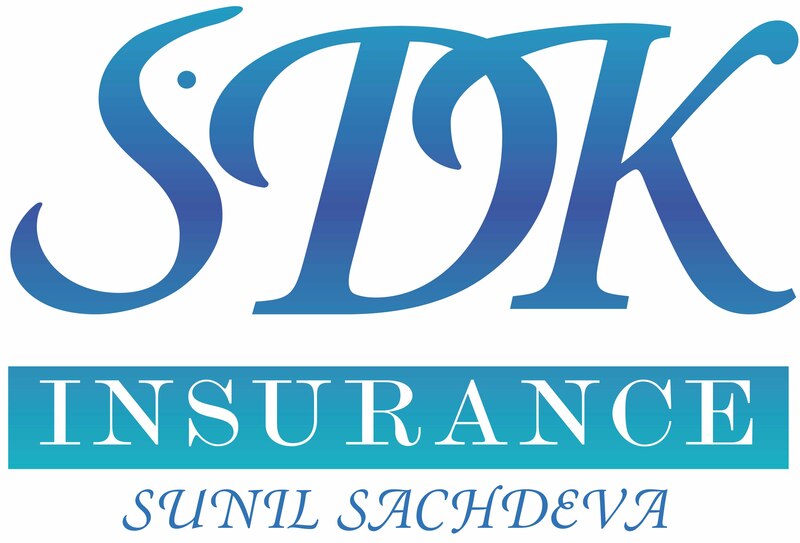 Take start-up entrepreneurs, Jawahar Chirimar, Sam Subramaniam, and M. Mahadevan who came up with the desi version of Chipotle, using the dosa as the centerpiece. Their creation, Soho Tiffin Junction, offers quick and easy meals with a healthy slant—dosas made of wheat and oatmeal batters served with salads and sides. This novel concept has a nutritional calculator, so you know exactly how many calories you are eating (dishes from 450 - 900 calories), allergen information, and vegan offerings, too. The cool part is you can pick your own fillings and have it within a rice bowl or a dosa or a salad bowl. Their first eatery is near New York University, and the hope is that young people will connect to Indian food their way, using digital ordering. 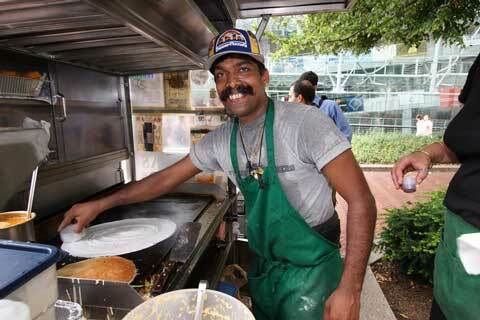 “Dosa Man” Thiru Kumar has been operating his tiny, world-renowned cart in the Washington Park area near New York University since 2001. He may well have single-handedly fed more dosas to non-Indians than anyone else in the nation, not to mention the hordes of his desi clients. (Photo: Preston Merchant). Thiru, a Sri Lankan cook, and his famous dosa cart are a well-known fixture in the Washington Park area near New York University. Come lunch-time, the dosa cart attracts a sizeable student crowd, many of whom may never have heard of a dosa until Thiru came along. Hari Nayak (left), taking dosas mainstream with Dosateria, a café inside Whole Foods in Tribeca, New York’s hip supermarket that offers dosa and other fusion crepes. Besides all the dosa places in Little India, including the Big Daddy of South Indian fare, Saravana Bhavan, this southern treat is now available at Whole Foods in Tribeca, New York’s hip supermarket. 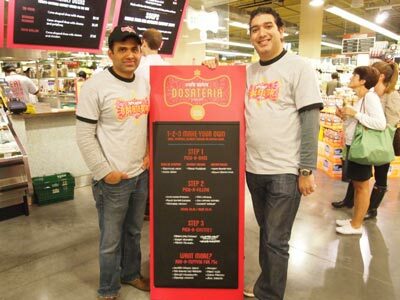 Dosateria is a café conceptualized by Hari Nayak, noted cookbook author and culinary director at Café Spice, a food company that manufactures and retails ready- to-go Indian meals, refrigerated products, and fresh Indian food at this supermarket. Now, a crisp dosa served with fiery sambhar is another good reason to go grocery shopping at Whole Foods. 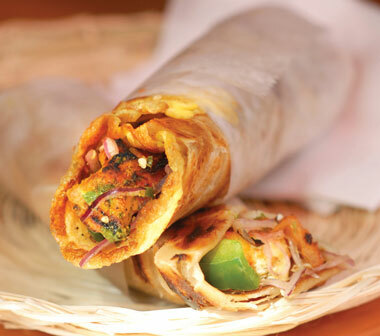 Dosateria serves both authentic and contemporary dosas, with signature fillings like Pulled Butter Chicken, Tofu Masala, Chili Chicken Koftas, and chutneys like Wasabi Avocado, and Mango Fennel. To tempt non-Indian consumers, Dosateria offers fusion breakfasts not likely to feature in regular desi dosa outlets. These fusion breakfast dosas include fillings of fried egg, sauteed spinach and spiced hash brown potatoes and cheese, and a breakfast uttapam topped with fried egg, roasted onions, tomatoes, fire roasted red peppers, and mushrooms. 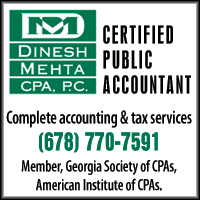 Café Spice owner, Sushil Malhotra is considered a veteran of the Indian food revolution in the US. He has several restaurants to his credit, including Dawat, for which the noted food authority Madhur Jaffrey acted as consultant. Malhotra’s Café Spice Express is a popular bistro in Grand Central, bringing Indian food to thousands of commuters. The Café Spice company also prepares and delivers Indian in-flight meals and offers catering services at airports, colleges, and corporate lunchrooms. Clearly, the Indian culinary scene in America has broken the mold and is growing in a host of exciting, never-before directions. A new generation of Indian- American chefs and food entrepreneurs, working in a multicultural milieu, has realized that to be widely embraced, Indian cuisine needs to be reinterpreted without losing its essence. The evidence on the ground seems to be that desi food is winning new converts every day. 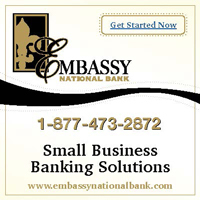 That calls for a toast to our bold and enterprising culinary crusaders! Lavina Melwani is a New York based journalist who writes for several international publications. She blogs at Lassi with Lavina. Follow @lavinamelwani. 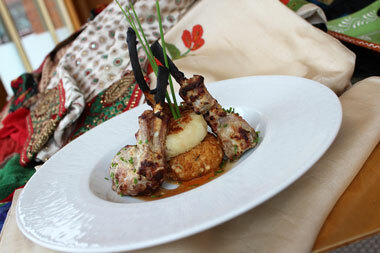 Cover photo: One of the many creative dishes offered by Thali.